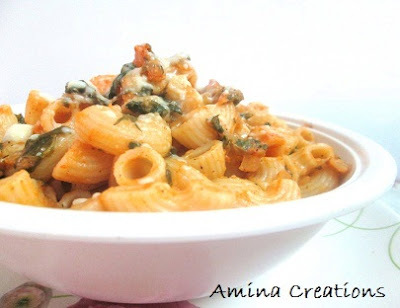 Pasta is one of my favourite dishes and I often experiment with it mixing different ingredients. Spinach and tomato pasta is one such dish. I combined whole wheat pasta with spinach, tomatoes and cheese and the result was simply awesome. The dish was filling, nutritious and you can feel the taste in your mouth even after you have finished eating. Chop the onions and spinach leaves and keep ready. Boil 6 to 8 cups of water in a large pan along with ¾ tsp salt. When it starts boiling, add the pasta and cook for about 10 minutes till the pasta has cooked but still has a bite. While the pasta is getting cooked, heat a nonstick pan with oil. Add onions and sauté till they turn golden. Next add garlic paste and sauté till the raw smell goes. Add red chilli powder, salt and pepper powder and mix well. Add the spinach and cook for a couple of minutes till it is soft and cooked. Drain the water from the pasta and add the pasta to the sauce. Mix well and add grated cheese on top.